The area between Waikabubak and Waitabula is densely populated. There are more modern buildings; traditional settlements are located further away from the road. All the year round the area is green and is used intensively for agriculture. Before you go down to the dry north-western plain you have a fantastic view of the region. There is Waitabula (Weetebula), the "capital" of the newly formed district Kabupaten Sumba Barat Daya and next to it Tambolaka. Sometimes the town is only called Tambolaka, like the airport. In town is the centre of the Catholic Church of Sumba. Waitabula has a cathedral, the hospital Rumah Sakit Karitas, a Rumah Kolping and a kind of monastery, Rumah Retreat St. Alfonsus. This is a well maintained property with monks' cells, cloisters and meeting rooms. It is a place of peace and seems to belong to a different world. Waitabula is also a trading centre for west-facing villages. It has the largest and permanent market on Sumba (has just been moved 3 km outside east) and a 2 lane main road. As a precaution the ugly and swanky new government buildings were built westwards, 10 km towards Pero in Kadula. 2 km towards Pero is the Sumba Cultural Research Conservation Institute. It was founded and is directed by Father Robert Ramone (cf. Links for his website). It has an extensive collection which is well worth seeing. Also the buildings themselves and the surrounding Palm Garden are very special, but somewhat retro and not necessarily original Sumba. The Tambolaka airport is situated north of Waitabula and the coastal and harbour town of Waikelo. Waikelo has the only port for large vessels in West Sumba. From here a ferry goes to Sumbawa. West of the harbour is a beautiful white sandy beach. The inhabitants of Waikelo are Muslims originating from Bugis. The magnificently painted houses are in total contrast to the rather sandy brown surroundings. It's very quiet here - unless a ship is coming in. 12 km further east is another Muslim settlement of Bugis, Katewel (Katewela), quiet and even dreamier, with a mosque from 1001. The village has a beautiful sandy beach. The beach to the east is Kawona. It will soon be exploited commercially. In the river between the two beaches are definitely crocodiles, so please do not swim near the mouth area. The residents of both villages are fishermen. They also boil salt with washed up tree trunks for fire wood. The coastal region is very dry and agricultural use is not possible. Between the 2 places, the new tourist spot Mananga Aba (Mananga Amba, Pantai Kita) is planned. A hotel and a road along the coast have been built. In contrast to this plans locals removed sand between the hotel and Katewel. About 1km behind the hotel and up to the Katewel bay there is now no sand beach any more. The inland, however, is completely dry and uninteresting. Only on the western edge of this area is a bit wooded and there are cashew nut plantations. There was also the small traditional village Oro, which was abandoned after several fires. Next to it is the small same-named resort with a tiny nice beach. Only some kilometres inland it is green and there are cashew nut plantations. Partly, the water from mountainous areas is led here and used to irrigate the plains for rice cultivation. At the foot of the first mountains there are traditional Sumba villages again. Two of these villages are Watukaredi and Bondo Kapambu. You get there before the road turns to Katewel at Karuni. At a burial ground you must go one of the 2 roads upwards. Both villages are predominantly Marapu villages and still well preserved in their structure. There is a great view from one village to the other and to the coastal plain. The village Totok (Chotok, Chodok) is more difficult to reach: Just off the bend to Katewel you have to drive inland along the paved road. Always keep right. The village can be seen from afar at the right. The road goes up to 400 meters and after 8 km you reach the village. The last steep kilometres consist of concrete lanes. 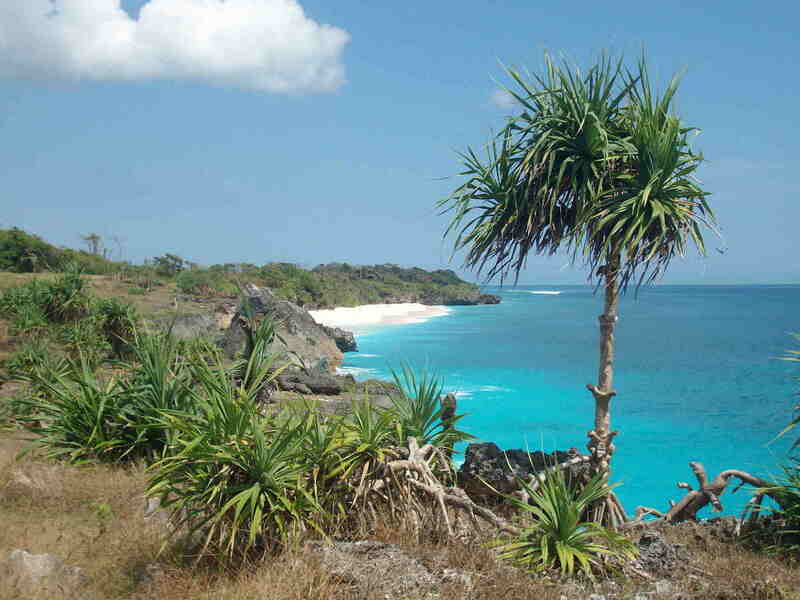 Due to the location and views, as well as its originality Totok is one of the most beautiful villages of Sumba.